On a tray, add the sliced peppers, chopped onion and chopped chicken. Then pour a drizzle of olive oil over and add the paprika then mix. Bake for 20 minutes at 180°C. On a baking tray, overlap the flour tortillas and sprinkle with grated cheese. 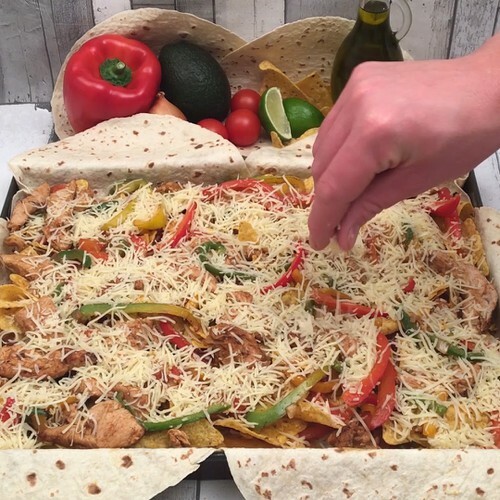 Add the chicken and pepper mix, the tortilla chips and sprinkle with more grated cheese. Place 2 more tortillas on top and fold the edges over inwards. Add another baking tray on top to keep the tortillas folded tightly together. Bake for 20 minutes at 180°C. In a bowl, make a salsa by mixing the avocados with chopped onion, lime juice, chopped tomatoes, coriander and a few drops of Tabasco. Cut slices of fajitas and serve with the guacamole to dip in to.